In part 1 we discussed how there are two categories of vitamins: fat soluble and water soluble. We dove into fat soluble vitamins in part 1. We talked about what they are, where they come from and what can happen if you get too much or don’t get enough. Like we talked about in the last post, solubility is about transportation through the body. Water soluble vitamins are easily absorbed in the intestinal tract and go into the blood stream. They aren’t stored, so toxicity is less likely than with fat soluble vitamins. This isn’t to say that toxicity can’t occur, it’s just less likely with a healthy functioning body. To see more about toxicity and deficiency symptoms, check out the last post here. Vitamin C is commonly associated with oranges and “curing a cold”, however, it’s a bit more complicated than that and it has a lot more functions than just immunity. 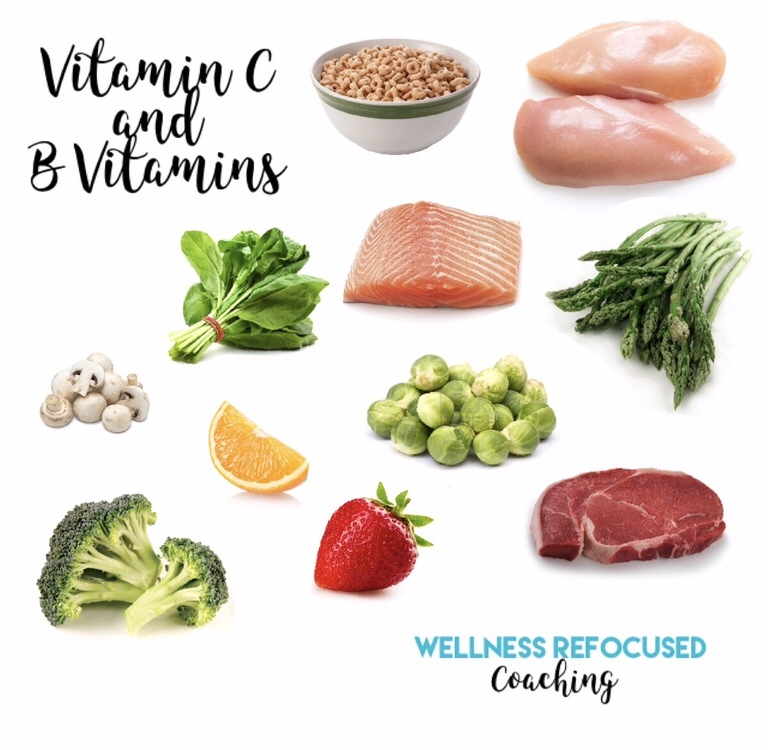 Vitamin C is required for a few specific functions like creating collagen, L-cartnitine, some neurotransmitters, hormones and DNA (protein)(Office of Dietary Supplements, 2018). That’s a bit more than what we typically think about when we think Vitamin C or a glass of juice. These functions are a part of our immune system, cardiovascular system, endocrine system and our nervous system. Collagen is a kind of connective tissue (fibrous protein) in the body and it plays a big role in healing, which is why Vitamin C is important (Marieb & Hoehn, 2016). 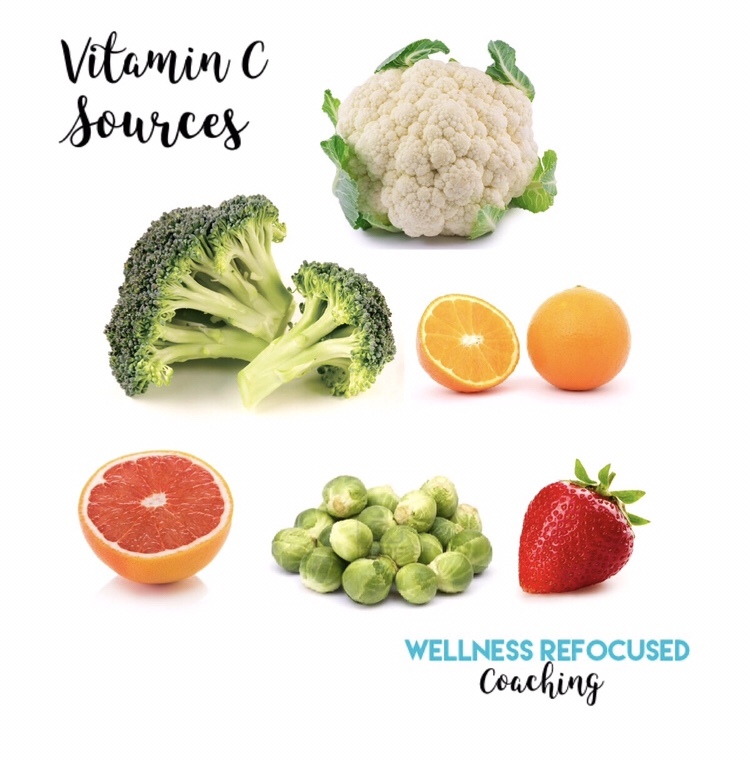 As an antioxidant, ongoing research has shown that Vitamin C helps with oxidative stress (an imbalance of free radicals and the body’s ability to detoxify itself) limit damaging effects of free radicals, which may prevent or delay disease and illness. Other immune functions are include improving nonheme iron transport. Nonheme iron can be found in plants and as you imagine is recognized by the body differently than meat-based sources. This also means that it’s transported through body differently. Decreased oxidative stress by Vitamin C helps with allow for transport. So does Vitamin C cure sickness? Vitamin C plays a role in keeping the body healthy, however, once immunity is weakened, Vitamin C consumption may not do a lot for you other than give you peace of mind (Thomspon & Manore, 2015). There has been research conducted looking at how Vitamin C prevents disease and illness like types of cancers. “Epidemiologic evidence suggests that higher consumption of fruits and vegetables is associated with lower risk of most types of cancer, perhaps, in part, due to their high vitamin C content” (Office of Dietary Supplements, 2018). This is in connection to the decrease of free radicals in the body. Other research has shown the taking vitamin C may not prevent a cold, but may decrease their duration. A varied diet with “excellent sources of vitamin C will also help you maintain a strong immune system” (Thompson & Manore, 2015). So how much should you consume? The Recommended Daily Allowance (RDA) for men is 90 mg/day and for women it’s 75 mg/day. If you’re a smoker, it’s recommended to consume about 35 mg/day more than the RDA and the upper limit is 2,000 mg/day. B complex vitamins are the other water soluble vitamins. They help with a number of functions and are most known for helping the body regulate energy metabolism. They act as a coenzyme, “which is a molecule that combines with an enzyme to activate it and help it do its job (Thompson & Manore, 2015).” The cellular functions they assist with are interconnected across organ systems and also include various aspects of brain function (Kennedy, 2016). 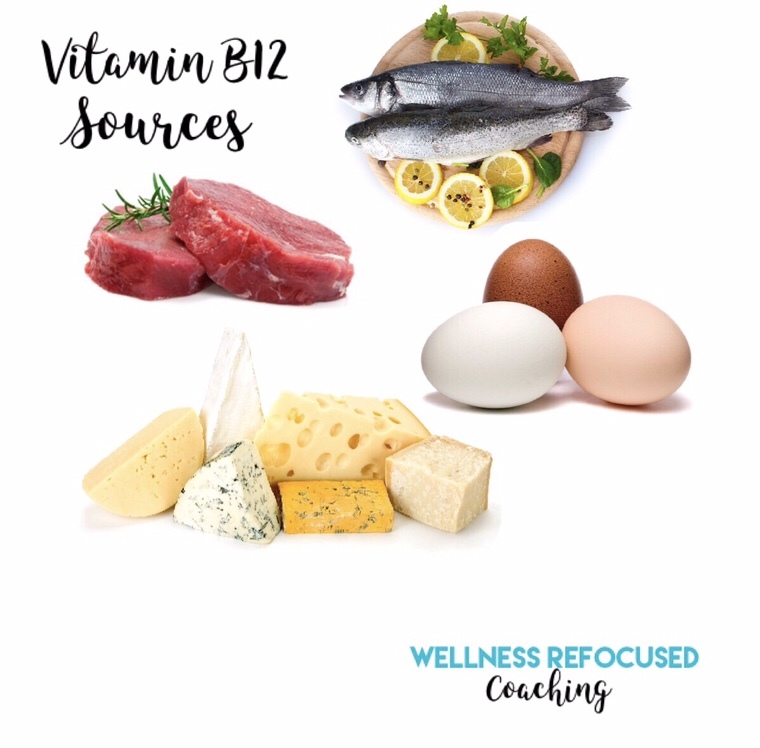 Thiamin (B1) assists with breaking down glucose for energy as well as the creation of amino acids leucine, isoleucine and valine – which are branched-chain amino acids that I briefly mentioned in the post about protein and amino acids. These amino acids are used in muscle and help produce glucose when needed (Thompson & Manore, 2015). Humans store very small amounts of thiamin in the liver, and since the vitamin has “a short half-life…continuous supply of it from the diet” is necessary (Office of Dietary Supplements, 2018). Riboflavin (B2) assists with carbohydrate and fat metabolism and occur in chemical reactions to produce energy. 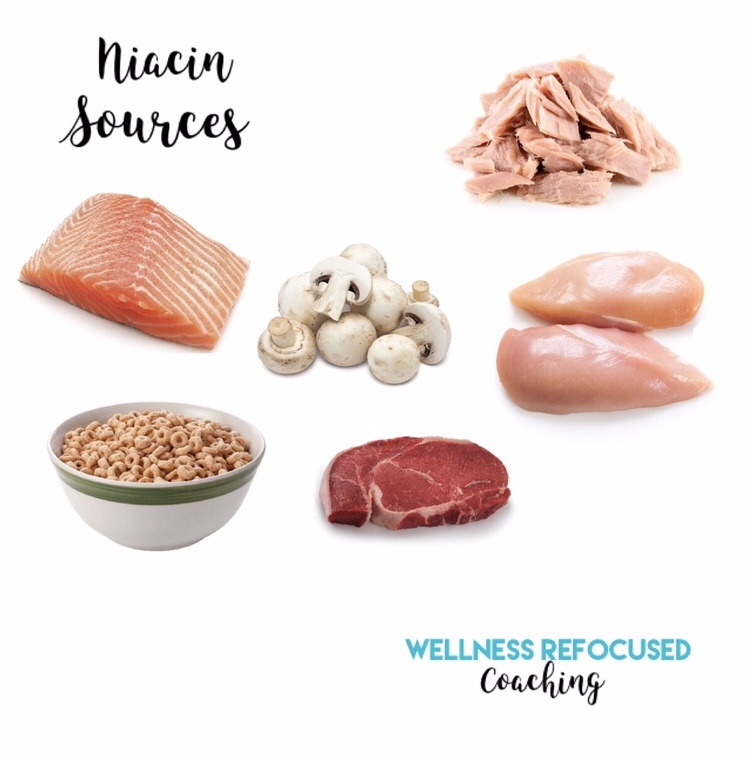 Niacin (B3) is acutally two compounds – nicotinamide and nictinic acid, which work to activate enzymes to metabolize carbohydrates and fat. Niacin plays a role in DNA replication and differentiation as well as repair. Without niacin, the digestive system, nervous system and integumentary system (skin) can be disrupted. Pyridoxine/pyridoxal/pyridoxamine (B6) similarly to thiamin, helps with carbohydrate and protein metabolism. In coenzyme form, B6 engages in over a 100 enzyme reactions that deal primarily with protein metabolism. It’s involved in hemogloblin (the component that transports oxygen in the blood) formation, helps synthesize neurotransmitters for cognitive function and normal brain activity. 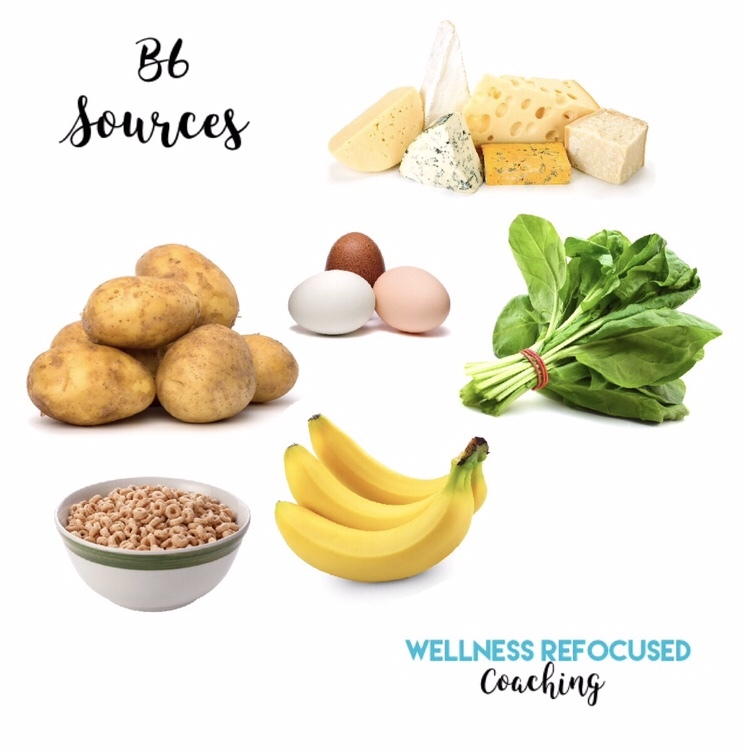 B6 vitamin is sensitive to both heat and light, so it can be degraded during cooking, however, it can be found in many foods that are consumed regularly in a normal diet such meats, fish, poultry, many vegetables and fruits. Folate (folic acid) is required for some of the body’s most basic cellular functions such as DNA synthesis, which is why it’s so important for women who are newly pregnant to have adequate intake during the first few weeks. Folate combined with the sperm-egg cell quickly develops tissues and structures of the human body. 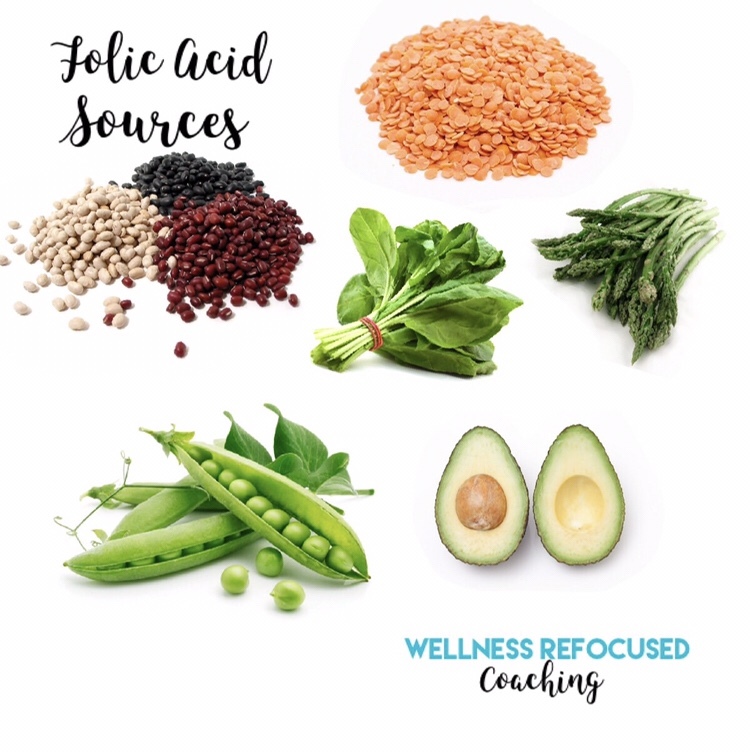 It’s not just in these developing stages that folate is necessary, throughout life, it helps with tissue maintenance and repair. Folate also contributes to the development of amino acids serine, glycine, histidine and methionine as well red blood cells. Without folate or B12, which we will get to in a minute, RBC have the opportunity to become enlarged from their inability to divide and mature. This can result in macrocytic anemia. Cobalamin (B12) assists with DNA synthesis, which helps with proper red blood cell formation (Thompson & Manore, 2015). Like we’ve talked about before, red blood cells transport oxygen and nutrients throughout the body. B12 along with adequate levels of B6 help reduce the risk of cardiovascular disease (CVD). The conversion of folate to its active form is dependent on adequate amounts of B12. If the conversion process is unable to occur, then folate is unable to be utilized properly even if adequate amounts are consumed regularly through diet (National Center for Biotechnology Information, 2018). Individuals who have malabsroption disorders such as celiac disease may have a higher chance of deficiency because of decreased intrinsic factor – a protein that helps with absorption that occurs in the small intestine. Pantothenic acid is an important in the breakdown and synthesis of fatty acids (Thompson & Manore, 2015). It’s role allows for foods in our diet to be utilized for energy, but also assists with excess fat storage for later. It can be found in a many foods, which is where it got it’s name – pan meaning every where. This vitamin isn’t typically measured in a healthy person since it is abundantly consumed and adequate intake is so small. 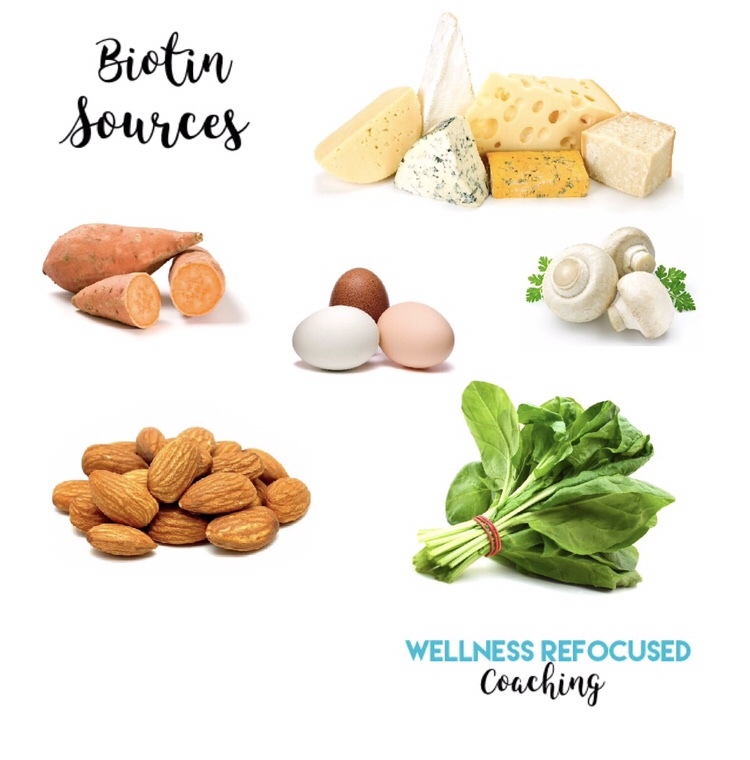 Biotin is a coenzyme for five different enzymes that breakdown all macronutrients providing energy for the body to function properly (Office of Dietary Supplements, 2017). Like Folate, it’s important during pregnancy because of it’s role in cellular development of hair, skin and nails, but recommended amount are in micrograms, which is a very small measure. Biotin is found in a number of foods, and while rare, if deficiency does occur it can lead to brittle nail, skin infections and hair loss or thinning. How much should you consume for B-complex vitamins? 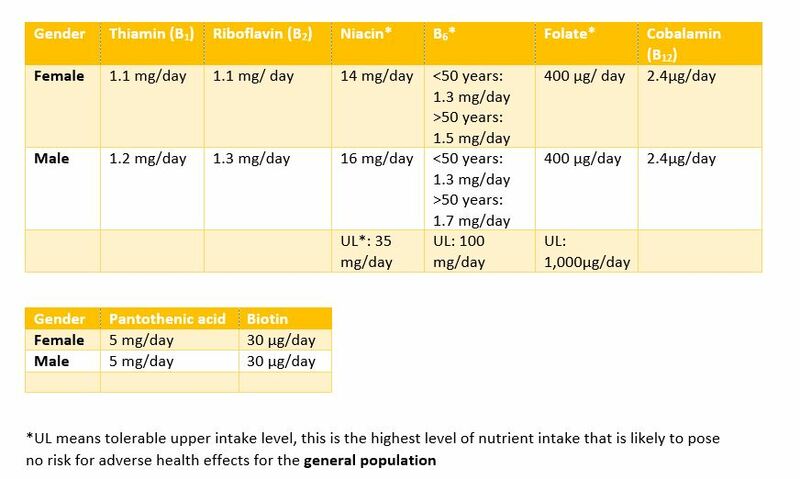 Below is a chart with the RDA for a general healthy individual. Many personal variables will change the necessary intakes such as if disease and illness like autoimmune disorders, age, activity level, current or desire to become pregnant. Currently, no research shows concerns with toxicity in relation to water soluble vitamins consumed through dietary means since they are not stored in the body, however, you shouldn’t take a vitamin just to take one. Be thoughtful and talk with your doctor about what a vitamin can do for you and if it’s necessary. Examine the variety in your diet and make sure that you’re getting enough real food with your fun foods. Again, potency is important to be mindful of and with supplementation there’s an increase risk of toxicity. Marieb, E. N., & Hoehn, K. (2016). Chemistry Comes Alive. In E. N. Marieb, & K. Hoehn, Human Anatomy and Physiology (pp. 23-59). New York: Pearson Learning Solutions. Thompson, J., & Manore, M. (2015). Nutrition: An Applied Approach. San Francisco: Pearson Education.